Image: Smashed windowpanes at Amiya Patra’s house after the attack on Saturday morning. 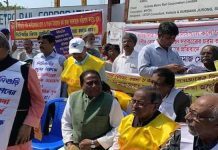 Bankura: Forget the field workers! In this season of political strife in Bengal not even the senior leaders of opposition parties are safe in their house! A gang of 50-odd miscreants, armed with lathis and other weapons, raided the residence of CPI-M’s newly elected central committee member and Bankura district secretary Amiya Patra at Taldangra today morning. 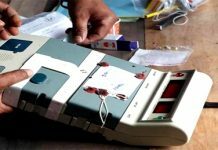 Patra has alleged that the miscreants were from Trinamool and the attack was aimed at scaring him to withdraw CPI-M candidates from the Bankura Zila Parishad election due in mid-May. The CPI-M leader has been able to identify some of the attackers who happen to be Trinamool workers at Bankura. “It was around 10.45 am and I was getting ready to go out for election campaigning. All of a sudden a shower of brickbats started on my house, smashing windowpanes one after another. I went out only to find some 50-odd armed people foraying into my house premises and they then vandalised the entire ground floor,” Patra said narrating the harrowing experience. Patra and his wife managed to escape the attack by hiding in a first-floor room. “They carried out the vandalism for about 10-15 minutes and then left shouting that if we do not withdraw all candidates from the Zila Parishad election, they will carry out similar attacks again. Also, they called up somebody over the mobile saying that the operation is over and now he could come. Soon after they left, a police team arrived,” the CPI-M central committee leader said. The vandalism has left all the windowpanes smashed, and has damaged air-conditioner, refrigerator, treadmill, etc. in the Patra household. Although police are yet to arrest anyone for the attack, a small police team has been deployed at Patra’s house to deter a repeat attack. Trinamool district president Arup Chakraborty has denied the involvement of Trinamool cadres in the attack. “CPM leaders have got into the habit seeing Trinamool even in their dreams. Our cadres have nothing to do with the attack on Patra’s house,” he asserted. 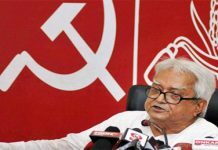 Earlier this month, CPI-M’s former leader of the Parliamentary party Basudeb Acharia and former Bolpur MP Ram Chandra Dome were attacked by suspected Trinamool cadres at Purulia and Birbhum, respectively.